Red Bank, NJ (prototype "for sale" press real) - One of only four exclusive homes at Cobble Close Farm, an architectural French masterpiece, is on the market for $ million. This roughly 3,000 sq. ft. 4 bedroom, 3 bath home features a 50-ft long living room, 3 private walled-in gardens, wine cellar, 14-ft ceiling library/family room, finished basement. About Cobble Close. Built by the Straus family who founded Macy’s, this estate sits on 13 old-growth acres and was built with materials transported from Europe or cast directly on the property by old-world artisans and masons brought here from Europe in the 1920’s. Once a working “gentleman’s dairy estate”, Cobble Close comprises a number of buildings totaling 29,000 sq. ft. that originally included an orangerie, worker’s dormitory, dining hall, care taker’s house, stables, cow barn and bull pen. 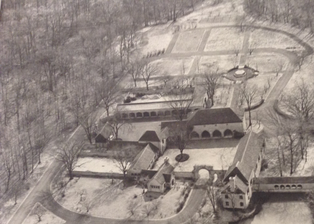 In the ‘60’s, the estate was turned into a 4-owner co-op. The buyer will have approx.one-fourth ownership of Cobble Close which affords access to the pool, cabanas w/bar, BBQ and game room as well as the beautiful grounds which are dotted with neo-classical statues, fountains and a livestock filled pastures. Sought-after property. Last year, the four owners decided to sell Cobble Close in its entirety for $10.9 million. However, one of the owners, who has lived at the estate for over 65 years, changed his mind and decide to stay. This is not surprising because properties at Cobble Close seldom come on the market because owners almost never leave, until now. “Only once in over 60 years has someone sold a home here without a death in their household. People don’t leave unless they are carried out.” said Mr. Mindham. He added that they get constant inquires about properties at Cobble Close which just don’t come up that often. The Mindham family moved to Cobble Close in 1994 upon the death of the previous owner, a European actress who 15-minutes of fame was when she appeared in the acclaimed Italian classic film "La Dolce Vita." Low cost upkeep: $ annual property taxes (for this home alone). Cobble Close is “farm assessed” has among the lowest property taxes in the area. By comparison, the home directly across the street, which sits on less than 3 acres, pays over $40,000 annually in property tax. Once a home of the stars, European nobility and now the backdrop for TV and fashion. Cobble Close has been featured in many movies, TV commercials and fashion layouts including Vogue, Victoria’s Secret and Brooks Brothers. In the 1950’s a European Countess and World War II spy, Stephanie Julianne von Hoenlohe live at Cobble Close. The actress Nadia Grey and her husband of “La Dolce Vita” once owned the Mindham’s home. Cobble Close is also known, but not as broadly, as one of the location sites for the acclaimed 1970's classic adult film "Misty Beethoven." 30-minutes during commute time. Non-rush hour drive-time to NYC is about 50-minutes. The home for sale is on the right as one enters the courtyard through the archway. It has a rambling configuration with a large walled enclosure. Please note that this photo was taken between 1930 - 1950.